Bilateral microtia with atresia. Kind of a big mouthful, isn’t it? Bilateral microtia with atresia is a condition that basically means being born without ears, which makes it an even bigger mouthful when you need to learn to say it in conjunction with your own child. This is something that my friend Jamie had to deal with a few years ago. Her daughter, Bobbi, otherwise-healthy, was born without ears, meaning also deaf. There were many consults with specialists, a fitting for a headband that acted as a hearing aid, and flights to California to doctors who were able to literally build Bobbi ears. While I would have loved to have been there to offer my support, I lived in a different state which made it impossible. Fortunately I was able to stay connected and be part of all the updates through a site called CaringBridge. For more than 15 years, the nonprofit CaringBridge has served as a lifeline of hope, bringing together families struggling with illnesses and tragedies. 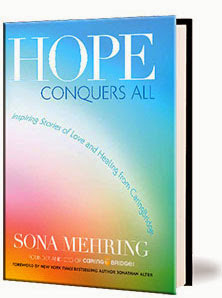 Sona Mehring, the founder of CaringBridge wanted to share these important stories to inspire hope, and so she has written a new book, Hope Conquers All. Ranging from young children with cancer, to adults awaiting transplants, these first-person accounts share the importance CaringBridge had in their personal journeys. You can find the book on the CaringBridge site. It would make a nice gift to provide uplifting tales for those who are in need of love and support, and all author proceeds go to CaringBridge. Have you ever shared via CaringBridge? I’d love to hear about it! I know you’ve heard me say a number of times how much I love books, and especially Christmas books. Now someone has found a way to extend the joy and excitement that comes with Christmas stories; there is “The Night After Christmas” book. “The Night After Christmas” picks up where the iconic “The Night Before Christmas” book leaves off. It takes you back to the North Pole with Santa after the presents have all been delivered and the children are all snuggled in bed with their new gifts. I always wondered what Santa did on Christmas night – and now I know! Baby C. has let me read this to her a few times and she loves the illustrations. I’m sure this will find a home in our yearly reading rotation. I’ve heard from a few others that it’s quickly become a much-loved book in their homes. I think you will love it, too. 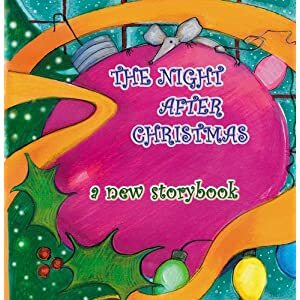 “The Night After Christmas” is available in both soft cover ($8.99) and eBook ($0.99) form from retailers such as Amazon, Barnes & Noble and Buy.com. What is your favorite “new” Christmas book? I have loved reading for as long as I can remember. I can remember when I was very little my parents reading to me; the memories are so firmly etched in my brain that I can vividly recall not only the stories and words themselves but also the pictures on the pages. Fast forward a few years and I can’t count the nights during elementary school that I’d park myself under the covers with a flashlight and read past my bedtime. I’m lucky that my parents were happy to feed my “addiction” and took me to family night at the public library, let me order from every Scholastic form that came across my desk and bought me the entire series of the Babysitters Club books (and that’s a lot of books). I still love to read, I just have much less time to do it. The invention of the e-readers has definitely made it easier, at least for me. Now I can just load up my Nook color with all the books that I am interested in, and when I catch a spare minute while waiting in the doctor’s office or to pick A2 up from football practice or on the couch after Baby C has fallen asleep on my lap, I can flip through a few pages of one of them. Recently I had the opportunity to read a new book called The Fine Art of Insincerity by Angela Hunt. Ms. Hunt is the author of more than 100 books, including the New York Times Bestselling novel The Note which was filmed as the Hallmark Channel’s Christmas movie for 2007 (it was the highest rated television movie in the channel’s history). This book centers around three sisters – Ginger, Pennyroyal and Rosemary – who return to empty their late grandmother’s cottage where, after losing their mother at a very young age their father would send them to spend every summer. Between them they had nine marriages, causing them to wonder if they had inherited “the Grandma Gene” as their Gran had herself been married seven times. They each also had a number of secrets that they were keeping from their spouses, each other and, in some cases, themselves. I had a feeling that I was going to enjoy the book after reading the first sentence of Chapter 1 that reads “Even without a calendar, I can feel MondayIt’s these secrets and the relationships between the sisters that really draw you into the book. settling into my bones.” I mean, who hasn’t woken up and had the same feeling at one point or another in their lives? While that was Ginger’s chapter (each chapter is written as coming from a different sister and bounces back and forth among them), as you get to know all the sisters you feel that it was a sentiment that could easily have come from any of them. One sister is about to find out that her husband is unfaithful, another is bored with hers and is tempting herself with thoughts of another, and the last is plotting the end of her own life in search for freedom. The book is a fairly quick read. It’s the kind of novel that you’d want to take out onto the hammock or to the beach and finish it off in a day or two. There are a lot of interesting webs both holding the family together and keeping them apart at the same time, and these webs keep the pace moving right along. The overall themes may seem a little less than light, but the lessons learned and conclusion make any “sniffly” parts worth it. You can purchase The Fine Art of Insincerity on Amazon in paperback or for the Kindle or at Barnes & Noble for Nook or in paperback. I received a free copy of this book to facilitate my review but no other compensation. All thoughts and opinions are 100% mine. When you hear the words “Home Ec”, what do you think of? Maybe your mind may instantly drifts back to your junior high or high school days of learning to hem a pair of pants or sew on a button, balance a checkbook, or boil eggs. For me, the first thing that comes to mind was the mandatory Home Ec class that was part of my eighth grade curriculum. We learned how to sew a pair of Bermuda shorts and a stuffed sundae-shaped pillow, how to set a formal table with all the extra forks and spoons, and how to cook a few basic dishes. Later in high school anyone that had been inspired by these lessons could sign up for a Textile Arts (sewing) or Foods (cooking) class. I actually did take one semester of Foods; we learned to make homemade Alfredo sauce, grill a mean steak and bake a cake shaped like a Big Mac (don’t ask, I have no idea why). We also learned that you suddenly had a lot of friends when you left class with a big box of fresh-baked chocolate chip cookies. So I was curious as to what to expect when I recently had the opportunity to read an advance copy of Chapter 20 of Heather Solos’ Home-Ec 101: Skills for Everyday Living – Cook it, Clean it, Fix it, Wash it . (You may be familiar with Heather and her “Home-Ec” ways from her blog). While I have not yet had the chance to read the entire book, the chapter that I read – a chapter on meal planning – gave me good insight into the style of the book and author. This is not reminiscent of your grandmother’s Home-Ec. While some of the tips may be timeless and may, in fact, be lessons you learned at your mother’s knee, the book is written in a much more contemporary style. Heather interjects a bit of wit while she teaches you how to plan a menu (sample menus are even included), stretch a dollar, and make dinner a less hectic event. One of the things I most enjoyed about this chapter – and Heather’s style, in general – is that she doesn’t try to force a lifestyle change overnight. She approaches meal planning and all it’s coordinating pieces with common sense and baby steps. Baby steps are something that if you are anything like me you will enjoy; I really hate books that say “start by throwing out everything you own, here’s a recipe for Boeuf Bourguignon, and why don’t you organize your closet by season while you’re at it”. With other chapters that give tips on scheduling, cleaning, home repair and more, I believe that most people will find something helpful or interesting in this book. In order to facilitate this review, I was provided a copy of Chapter 20 of this book by the One2One Network. I received no other compensation and the opinions are 100% my own.